During the early stages of the game, setting your tax rate correctly can mean the difference between being able to build and research what you want and need, and not being able to. Through the early quests, the game urges you to play with the tax rate and maximize income. The tax rate however, directly affects the happiness in your city, which effects the population, which effects eventual tax income and your ability to man your farms or produce troops. So, how do these numbers all relate? 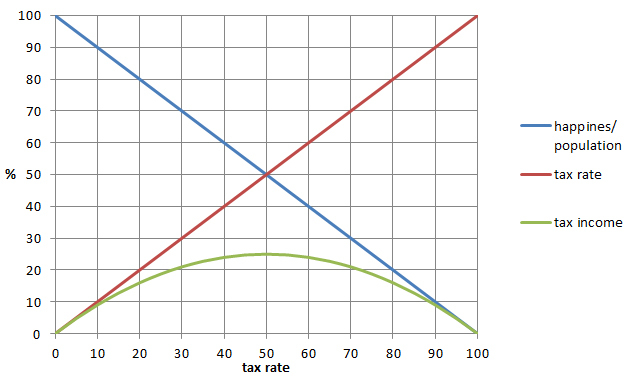 Note that tax rate is both graphed as well as used as the x-axis. As you can see, a fixed tax rate of 50% will, once population has stabilized, net you the largest income, regardless of population size. However, the tax income you need changes throughout the phases of the game. During the early stages of the game (read 7-days), you will want to maximize your income to be able to do the research objectives from the academy. As you cannot attack and thus farm, this is likely to be a good part of your income. This strategy makes use of the fact that taxes can be changed instantaneously, while population is adjusted 1% per 6 minutes. So taxes can go from 0 to 100 in a second, while the population would need 10 hours to reach 0%. Of course, being in an alliance also gives the possibility to ask for gold, but hey, it wouldnt be a strategy game without some strategy to dive into if you want 😉 ! At this point, taxes become rather useless. Gold is the easiest farmed resource as it is virtually impossible to protect. When I farm for an hour or so, I always have more than 1m gold in my pockets. So research wise, taxes could be set to 0%. However, your hero will still needs its salary when you appoint it to a task in the Great Hall, which most of the time should be the resources job. Unfortunately, your hero quits his job (un-assigns) when your out of gold. For this reason, I put my tax rate at whatever gives me the current salary needed to keep my hero assigned to his post. Even with 2m at the bank, I simply dont want to be robbed of my gold, which likely will happen one day, and then to forget to re-assign him to his proper job. Not that this all matters that much, but thats the way I roll tax-wise. This entry was posted in Articles, City building, Strategy and tagged happiness, Hero, income, kingdoms of middle earth, population, rate, research, salary, tax by beardmonkey. Bookmark the permalink.